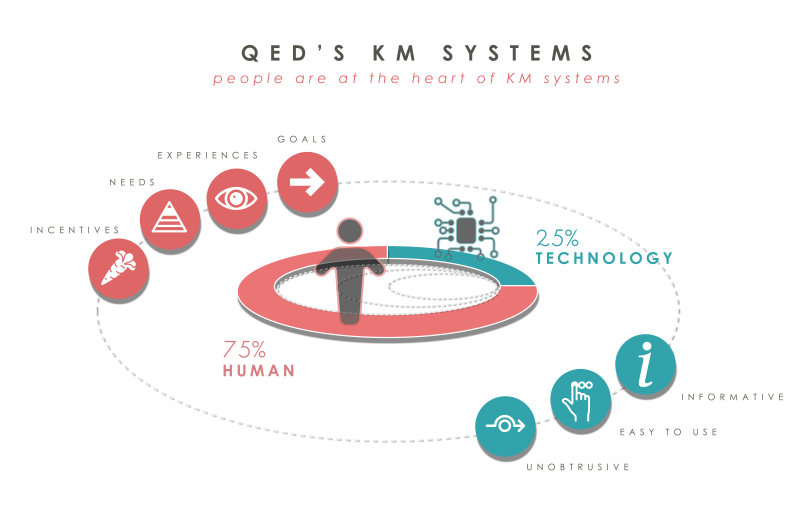 QED has a straightforward approach and methodology to deploying successful KM systems that can be explained simply: Get the people engaged and get the technology right. Getting people engaged is critical to ensuring the right technologies are selected to maximize user needs. When looking at the breakdown of work to implement successful KM systems, the majority (about 75%) is about the people, and only a quarter of the effort is about the underlying technology (see Figure below). While the importance of the technology cannot be understated—it is the ultimate enabler that drives efficiency and productivity gains—it needs to respond to the ways in which people will use it and demonstrably enhance their work. Because KM technologies are not mandatory, users must “opt in” to using them. This means they must be easy to use, unobtrusive, and informative. Users only adopt KM systems that offer compelling and clear benefits for both them and their organization. People are at the heart of KM systems development. Well-designed KM systems help people do their jobs more effectively by making it easier to access and share a wealth of organizational know how. Human-Centered Design (HCD) is an approach to problem solving that puts people at the center of system development and designs solutions that are responsive to their needs and realities. It goes beyond traditional IT requirements gathering, by encouraging designers to understand the motivations of users and customize products and services based on their input and direct experience. QED applies HCD principals by building sequential rounds of varied engagement with client staff, including focus groups, interviews, surveys, and interactive knowledge cafés. Performance Support. Performance support is KM’s end game. It connects people with the knowledge they need at the right time so they can apply it in the right context. This is about process; it turns KM into knowledge process management. It crafts KM milestones into an organization’s existing business processes by adding learning moments, innovative deliverables, events, peer assists, after action reviews, and other triggers that incentivize people to contribute knowledge, share, and engage at specific points in a process. Change Management and Communications. Change management is about communicating with and engaging people who will ultimately use the KM systems. It targets, sets expectations, explains the “what’s in it for me,” and alerts users to incentives for sharing. Early engagement ensures that people have a stake and that the KM solutions are responsive to their needs. QED builds communications milestones into implementation plans, including engaging events and activities designed to generate interactivity and feedback loops. We also recommend establishing a Steering Committee of senior leadership that acts as a sounding board. KM is inherently difficult for large organizations to deploy and can be challenging to get right. Success cannot be guaranteed with a single technology or methodology, because KM is unique at each organization, and especially in the context of global teams. 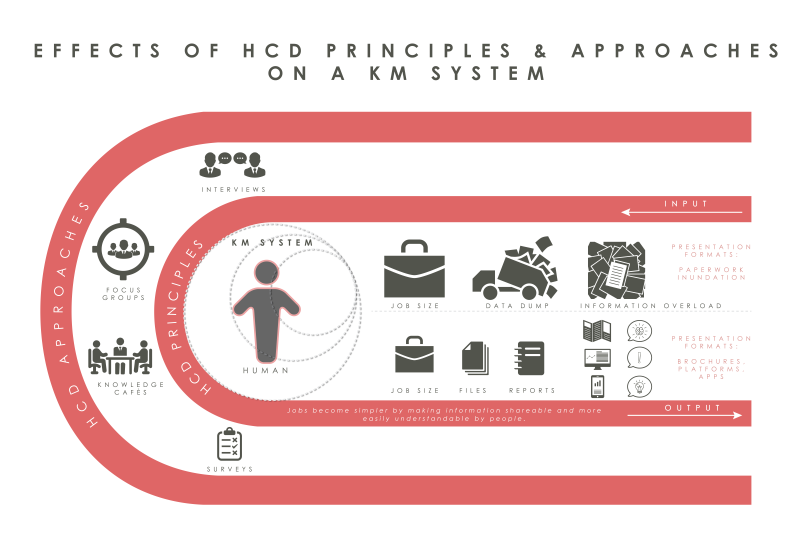 However, the importance of adopting a Human-Centered Design approach and putting people as a critical priority to establishing a strategic and well thought-out KM system cannot be understated.